" - To Build a Twisted Bridge - "
This is a follow-up on a discussion at the 1999 Bridges conference; it is a topological / geometrical study of how the structure of a Moebius band might be applied to bridges and/or buildings, with the possibility of creating an intriguing construction on the Campus of Southwestern College, to commemorate the series of annual Bridges conferences started in 1998. Fig. 1: M.C. 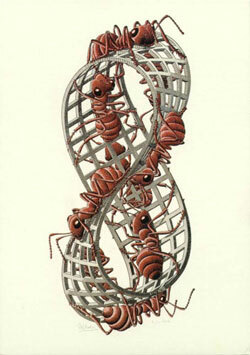 Escher's "Moebius Strip II" © 2000 Cordon Art B.V., Baarn, Holland . At the Bridges'99 conference, Jason Barnett gave an inspiring presentation "A Bridge for the Bridges" . He showed scale models of spaces reminiscent of Escher structures that combine many different perspectives in surprising ways. However, Barnett's buildings were realized in 3-space and were designed to be readily navigable by human observers. In that session, the idea was put forward that it might be desirable to construct a monument on the Campus of Southwestern College commemorating the series of annual Bridges conferences. Given the interests of the typical conference participant, such a structure might well be Escher-like or reminiscent of the shapes of Klein bottles or Moebius bands. Perhaps - and most fittingly - such an intriguing shape might be applied to some form of pedestrian bridge crossing a little creek or connecting two tall buildings. 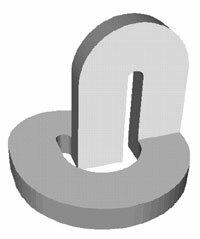 Inspired by those discussions, this paper investigates several ways in which the structure of a Moebius band could be imposed onto a functional bridge (Section 2) or onto a habitable and usable building (Section 3). 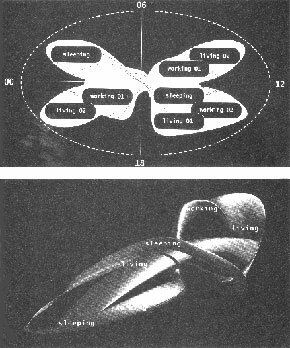 We conclude with some Moebius structures that have a purely aesthetic purpose (Section 4). The title of this treatise pays homage to a delightful science fiction short story by Robert A. Heinlein, "-And He Built a Crooked House-" , in which an architect builds a 4-dimensional house in the shape of a hypercube. After an earthquake, the house traps its occupants who are then doomed to run around in the 3-dimensional surface of this structure. Contrary to this unfortunate outcome, our focus is on finding structures that are not only conceptually intriguing, but also sound and of practical use. 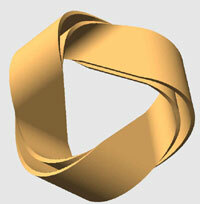 The first idea that comes to my mind when I hear the term "Moebius" is that of a belt twisted through 180 degrees. However, if this idea is applied in a straightforward manner to the construction of a bridge, we end up with a surface that is difficult to walk on; after crossing less than half the length of the span, travellers would slide off the bridge (Fig. 2 ). Thus the first task is to look for modifications of the basic concept to create a more or less level walking surface along the whole length. After that I will explore the possibilities of transforming the topology of a closed Moebius band into a shape that can serve as a bridge. Fig. 2: A slab with a longitudinal twist -- a key element for a Moebius bridge -- is difficult to walk on. The first and fundamental challenge is to find geometries that are clearly twisted, but on which one can still walk, and which will even admit wheelchairs, i.e., surfaces that have a continuous strip of a nearly horizontal surface along the whole span of the bridge. A first inspiration may come from ruled surfaces, in particular from a single-shell hyperboloid, which exhibits a rather twisted look, but can be composed entirely of a bundle of straight lines. The wish to keep a more or less "level path" across the chasm to be bridged implies that we also maintain horizontal tangents in the lateral direction. We may model these constraints with a Bézier patch that gives us sufficient degrees of freedom (Fig. 3). Fig. 3: A longitudinal twist can be simulated with a suitably distorted Bézier patch. Using five control points in the lateral direction, allows us to create a "flat" zone of adjustable width. Along the length of the bridge span this flat zone shifts from one edge of the patch to the other, i.e., at one end of the bridge the right-hand wall is pulled high, and at the other end the left-hand wall. This will create the impression that the slab has been flipped through almost 180 degrees. In the longitudinal direction, three or four rows of control points are sufficient to define the transition of the cross section from one end to the other, and perhaps to impose a slight arching of the bridge for stability and for aesthetic purposes. Contemplation of the shape in Figure 3 makes one realize that the main reason that travelers do not slide off this bridge is the fact that its cross section is a "hollow" C-shape which offers a spot with a horizontal tangent for all of its orientations. We can exploit this idea more directly by sweeping a semicircular cylindrical element along the arch of the bridge. We can twist this cross section through 180 degrees and still maintain along its whole length a continuous path with a horizontal lateral tangent (Fig. 4). It should be noted that on such a surface one could walk either on the inside or on the outside of the C-shape; in the latter case we would twist the cross section in such a way that, in the middle of the bridge, the opening of the "C" points downwards. However, for a large portion of the span, travellers may not even realize that they are walking on an open C-profile; it may just feel like walking along the top of a giant cylinder. I believe the sense of "twistiness" of the bridge would be mostly absent in this option. In Figure 4, I show my preferred solution, where the profile is oriented like a "U" at the mid-point, and in which travellers across the bridge are naturally sheltered most of the way. Of course, towards the ends of the span, some railings must be added for safety. Fig. 4: Swept C-shaped cross section with a longitudinal twist of 180° also offers a level walking surface. 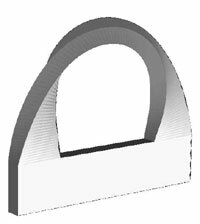 To shape such a twisted bridge surface into a closed Moebius band, we have to somehow form an end-to-end loop and close it off with the appropriate orientation. This closure could occur in three fundamentally different ways: below the walkway, and thus symbolically acting as the foundation or support for the walkway (Fig. 5a); above the walkway, as a large arch from which the walkway could be "suspended" in some way (Fig. 5b); and, third, besides the walkway -- perhaps forming a separate alternative walkway. Fig. 5: Closing the loop of the Moebius bridge: (a) as a supporting structure, (b) as a suspension arch. The first alternative leads to a rather straightforward implementation (Fig. 5a). This is just a simple, singly-twisted Moebius band. All the twist is in the "return path" and support structure. Aesthetic goals and engineering functionality might be nicely combined if the "bulge" created by the twisting slab where it passes through its vertical orientation is made to touch the middle of the horizontal portion of the slab that serves as the actual bridge; it can then act as center support and thus allows the slab to be thinner. Access to the bridge surface is also easy in this configuration, since the slab turns downwards at both ends of the span. 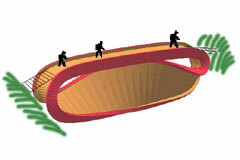 Light-weight, transparent-looking "on-ramps" would connect the main structure to the slopes of the trench to be bridged. The second alternative develops from an upside-down version of the first. The "roll" of the slab through its vertical orientation can now serve as a robust suspension arch from which the walkway could be suspended with many thin steel cables (Fig. 5b). One difficulty with this arrangement is that the travellers will now walk on the "inside" of the structure, and access to this surface has to be provided in some way. One solution is to cut openings through the band itself at both ends of the horizontal bridge section where the band turns upward. This will produce two doorways, each framed by two columns formed by the outer flanges that support the slab. Another possibility is to bend the twisted surface laterally away from the main walkway, thereby giving straight access onto the walkway. 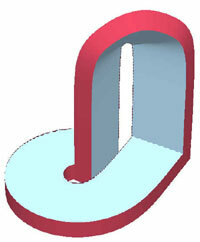 If the walkway happens to be in a concavity of the main Moebius band (Fig. 4), then such a bending away to the sides is reminiscent of the swept C-section ribbon sculptures of Brent Collins  in which he aims to orient the C-shaped profile in such a way that its opening always points away from the bending direction of the space curve, i.e., in the negative normal direction of its Frenet frame. This results in a ribbon surface of consistently negative curvature. However, a C-shaped profile is clearly two-sided; it has an inside and an outside, and it can therefore not readily be closed into a single-sided Moebius configuration. To achieve this goal, we may gradually straighten out the C-profile into a flat slab, which can then readily be connected back-to-front. This may again lead to a configuration where the return path forms a suspension arch (Fig. 6). (a) side view, and (b) view from one end looking down the walkway. So far, all my constructions started with a functional walkway, then I tried to close those twisted surface pieces into Moebius loops. 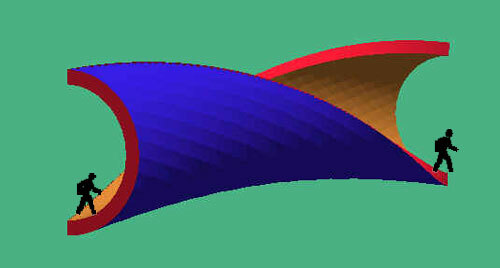 Now I will start from various geometrical Moebius configurations and then see how such a shape might serve as a bridge. For this purpose, the work of M.C. Escher serves as a great source of inspiration. 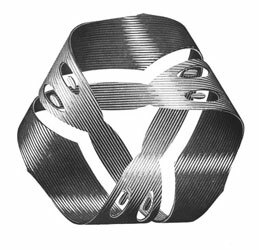 In "Band van Möbius II" he draws a simply twisted band in grid form that serves as a climbing structure for nine ants (Fig. 7a). Let's study this shape and see in which way it may be turned into a bridge. The portion facing backwards in Figure 7a offers a reasonably flat surface that runs most of the length of the whole object. It may serve as a walking surface if the whole structure is oriented suitably in space and the twist is redistributed somewhat differently around the loop (Fig. 7b). Fig. 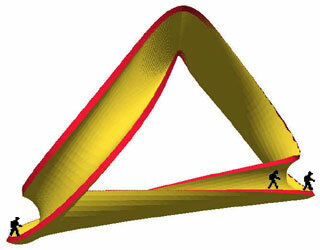 7: Use of the geometry of Fig.1  (a) for a bridge design, (b) by walking on part of the surface, and (c) by walking on the widened edge of the Moebius strip. Alternatively, we could orient this surface downward and thereby turn the front-facing portion of the rim of this object into the proper orientation so that it could be walked on. The edge would have to be widened to make a safe and comfortable walkway. This could be accomplished by making the whole band much thicker, or by using it only as a support structure and by adding a perpendicular flange onto it to serve as the actual walking surface. Since this flange would of course run around the whole Moebius band, it would convert the cross section of the band into that of an I-beam. Upon closer inspection of Escher's object, it appears that the backward-facing edge of this same part of the Moebius band has a somewhat larger longitudinal extent than the front-facing rim, and might thus be more suitable to serve as a bridge over a trench or ravine of a given width. But as is evident from (Fig. 7b), some part of that edge is obstructed by the crossing slab that we originally considered as the walking surface. This can easily be remedied if we a modify the structure so that it intersects itself at the central point (Fig. 7c). This self-intersection may also increase the overall strength of the whole structure. M.C. Escher also drew another Moebius band that exhibits three-fold symmetry and which has a built-in twist of 540 degrees (Fig. 8a). This basic arrangement also appears in the familiar recycling symbol (Fig. 8b) created by Container Corporation of America during Earth Day 1970. A contest for graphic art students to design a symbol representing paper recycling attracted over a thousand entries which were judged at the Aspen Institute for Humanistic Studies. The winning entry submitted by Gary Anderson, an art student at U.C. Berkeley, was modified by William Lloyd into the well-known "chasing arrows" design. Fig. 8: (a) M.C. 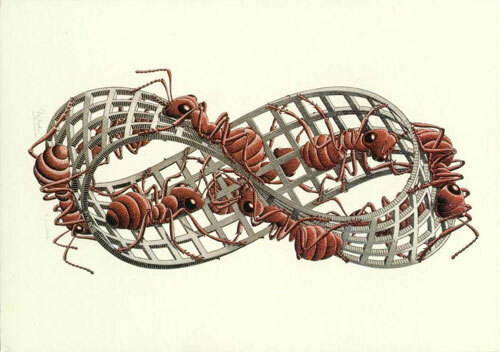 Escher's "Moebius Strip I" © 2000 Cordon Art B.V., Baarn, Holland ; (b) recycling symbol with same three-fold symmetry. Sometimes one encounters a modified form of the recycling symbol that has an overall twist of only 180° (Fig. 9a). We will explore the usefulness of this structure to create a pedestrian bridge. We follow the possibility shown in Figure 7a of walking on the edge of the Moebius band, rather than on its flat surface. Figure 9b shows how one inner section of the edge might be used as a walkway. Fig. 9: (a) Asymmetric recycling symbol; (b) conceptual application to a bridge design. However, there is an intriguing possibility to also use the "suspension arch" as a secondary walkway. Reminiscent of a strongly arched bridge in a Japanese tea gardens, steps may lead up on the outer edges of the suspension arch. On the very top, where the mostly vertically oriented band needs to flip over to make the desired Moebius connection, a flat spot might be created suitable for a small observation platform. 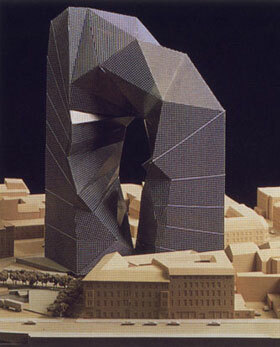 In 1992 Peter Eisenman designed a Moebius building (Fig. 10a). One gets the impression, that this particular building was purely a mental exercise in the strictest tradition of an architectural design paradigm known as "function follows form." It is not immediately clear how this particular form can be structured internally to make a set of convenient and usable floors and suites. Another "Moebius Haus" was conceived by Van Berkel & Bos who try to capture the endless figure-8-type movement possible in this topo-logy in some internal unstructured space (Fig. 10b). Fig. 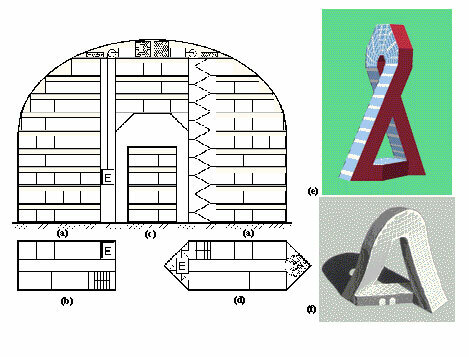 10: Moebius buildings: (a) a proposal by Peter Eisenman, (b) a concept by Van Berkel & Bos. For this study we assume that the client wants a reasonably traditional office building, say, for a Mathematics Institute, but one that clearly reflects the shape of a Moebius band. We are not interested in just a thin mathematical surface, but in a prismatic structure of substantial volume that exhibits the desired "twist." We start our analysis with a cubic module of 32 feet on a side. This is large enough to accommodate two 12 foot deep offices and an eight foot corridor "across" the building, and two stories in the vertical dimension. We first will explore ways of stacking these useful modules so that the essence of a Moebius strip is conserved, i.e., if we follow along one face of the prismatic toroid, we expect that it will take more than one loop around the ring before we come back to the starting point and that we will visit "other" faces of the prismatic structure on this path. Three such cube modules in sequence can form either a straight row or a small symmetrical L-shape. Four cubes in sequence can form a planar L-shape with one leg twice as long as the other or a planar "Z"/ "S" jog structure. 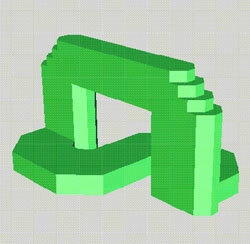 But they can also form a twisted, 3D Z-structure, which may appear as a right-handed or as a left-handed version. 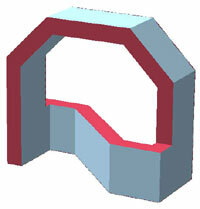 It is the appearance of this twist element that carries a path on the surface of the prismatic structure from "one face" to "another". The simplest "twisted" loop can be built from just ten such cube-modules (Fig. 11a). A path on one of the prism surfaces incurs a twist of 90 degrees on every loop around the structure. It thus takes four loops to come back to the starting point, and during this traversal we will have visited all the exposed cube faces on the whole structure. But let's assume that the client wants a "normal" Moebius band, in which we return to the starting point after only two revolutions. There are many basic configurations in which two twist elements can be arranged so that their effect adds up, rather than cancels out, and so that the total prismatic twist around the loop becomes 180 degrees. Fig. 11: Twisted configurations created from unit cubes: (a) simplest configuration with a 90o twist, (b) and (c) two configurations with a complete 180o Moebius twist. One configuration is shown in Figure 11b. The twist elements have been placed at the corner of the loop and have been stretched in the vertical direction so that they form entrances into the courtyard / atrium of the building. 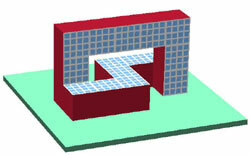 Another possibility, shown in Figure 11c, introduces a 3D crossing in the form of a sky-bridge in order to close the loop with a 180o twist. Alternatively, this bridge can be straightened out, while the connecting path at ground level becomes S-shaped (Fig.12a). Figure 12b gives an impression what an actual building, derived from this basic configuration, might look like. Fig. 12: Transformation of Figure 11c into (a) a related structure, and (b) into a building sketch. Now that we have seen that it is indeed possible to create Moebius shapes from rather conventional building elements, we might want to make the Moebius shape more apparent. First, and foremost, we would like to use a more band-like structure, i.e., the aspect ratio of the rectangle swept along the loop should be at least 2:1. In addition, we want to make the small sides and the long sides of the cross section visibly distinct by using different materials. The large faces could be made from glass and steel, which would be natural for the window fronts, and the narrower faces could be made from concrete, or could be covered with dark, opaque glass. 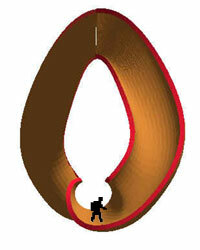 However, just sweeping a 32' by 64' cross section along a circle with continuous twist (Fig. 13a) will not lead to a practical building geometry. Figure 13b shows a modification of the basic Moebius shape in which one end has been squared to form the base of a building and the rest of the loop is connected to it with two right-angle turns. This shape can be further deformed until it resembles the bridge structure of Figure 12b with an S-shaped return path underneath, but now the return section stands on its small edge (Fig. 13c). As a further refinement, the impractical wide span of the bridge can be shortened, by narrowing the turns in the S-shaped building section underneath. Fig. 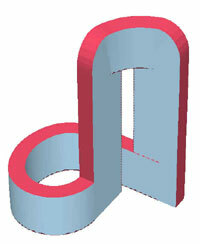 13: Deforming a basic (impractical) Moebius loop into a usable building geometry, (a) through (c). Now it is time to look more closely at the internal organization and the resulting requirements for the surfaces of these structures. Clearly the more lightly colored vertical walls of the S-shape should be in glass, since they are natural window surfaces. The narrow faces of the prism could then be kept fairly opaque. To enhance the visual difference between the two types of surfaces even further, the narrow surfaces could also be reshaped into wedges, which would show off the Moebius property most dramatically. On top of the S-structure, where the wedge runs horizontally as a "roof," it could hide air-handling units, and along the vertical edges of the two towers it could accommodate fire stairs or elevator shafts (Fig. 15d). The problem with the structure in Figure 13c is that this opaque face or wedge runs on the sides of the bridge on the facades where one would prefer to have a set of good windows; this prime real-estate should not be obscured for the purpose of maintaining continuation of the Moebius edge. In Figure 14, I explore a different way to work around this problem by reversing the roles of the wide and narrow sides of the swept cross section. Fig. 14: Starting form a prominent building feature, then closing the loop in various ways (a) through (c). In Figure 14a I started with a dramatic vertical loop cut from a 32' thick slab that has plenty of good window spaces on both sides. The narrow Moebius edge runs vertically at the ends of the floors in the two towers and also sweeps over the top of the building. Figure 15 illustrates how the space in this prominent arch can be put to good use and provide much office space with generous windows. To make the desired Moebius closure for the overall structure, we need to connect the front side of one tower with the backside of the other. This can be achieved with a spiral loop formed by a low horizontal building branch (Fig. 14a). In our envisioned Math Institute, this part could accommodate public functions such as the class-rooms, the library, the cafeteria, and the reception area. The latter three functions can make good use of skylights to accommodate a glass roof as the logical continuation of the glass facades of the main building loop. The class rooms could be placed in the lower story or underground. Thus the mostly window-less Moebius edge, that needs to run around the horizontal faces of this lower part of the building, could lie just slightly above ground level, where vertical windows can most easily be traded off for copious skylights. Fig. 15: (a) Elevations, and (b) floor plans of the arch in Fig. 14a; (c) cross section of an "on-edge" branch of the basic rectangular profile, e.g., as used in Fig. 14c; (d) a variant of the profile with wedges at the ends. (e) and (f) two different views of another use of such an arch in a tall building with slanted towers. The bottom portion of the structure in Figure 14a is rather larger. We can reduce its area by angling the two towers at 90 towards each other. This could change the originally semi-circular slab at the top into a conical shape (Fig. 14b) - a structure that might be difficult to build and to outfit with elevators all the way to the top floor. Also it is not clear how usable the assignable floor spaces would be in this conical part of the building. Thus the concept is further developed in Figure 14c. The conical top section has been replaced with just a short, bent bridge with perfectly level floors and vertical walls. In contrast to the bridges in Figure 13, the elongated cross section is now swept in a vertical orientation through this part. This keeps the Moebius edge on top and bottom, and maintains good window fronts on the vertical faces. This same approach can also be used at the bottom end of the building. The spiral connection between the two towers can be made with a vertically oriented sweep, providing much good window front (Fig. 14c). One possible drawback with this geometry is that it may lead to rather tall buildings. Even if the swept rectangular cross section is reduced to only 30' by 60', an arch tall enough to loop over its own cross section put on edge would be at about 140' tall. Still I believe this arched configuration of the sweep has a lot of potential and can be shaped into attractive and usable buildings. Figure 15e and 15f show another way of closing this dominant arch into a Moebius loop. The legs are bent forwards and backwards like the two leaning towers in the "Gate of Europe" in Madrid. This spread must provide enough separation at the bottom to accommodate a fairly direct connection between the back-side of the front leg and the front-side of the back leg. Again this low, horizontal portion would be provided with continuous skylights that offer dramatic views of the arch 15 to 20 stories above. A functional bridge or building may be beyond the means that Southwestern College is willing to expend on a commemorative construction. Perhaps a pure art object is a viable alternative. In this section we explore the realm of artistic Moebius bands and spaces. Fig. 16: Split Moebius sculptures by Keizo Ushio: (a) singly twisted (b) triply twisted. Keizo Ushio  is a sculptor who has celebrated twisted band structures in many different forms. While I am not sure whether he has ever carved an elementary, singly-twisted Moebius band, he has created doubly and triply twisted bands, and dozens of split Moebius bands (Fig. 16a,b). 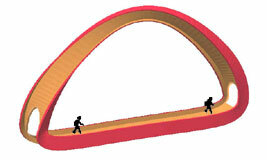 Often his Moebius strips are produced by a rectangular cross section swept along a simple space curve with the proper twist so that the "front" side of the slab connects to the "back" side after one travel around the loop. Most often Keizo Ushio takes such a Moebius band only as the starting point, and then adds extra drama to it by splitting it along a center line. 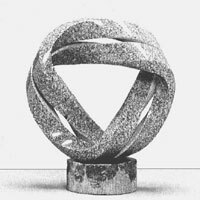 In Keizo Ushio's sculptures typically the large dimension of a wide band is split down the middle, resulting in two nearly square prismatic shapes travelling side by side. This is a natural approach for sculptures carved from stone. 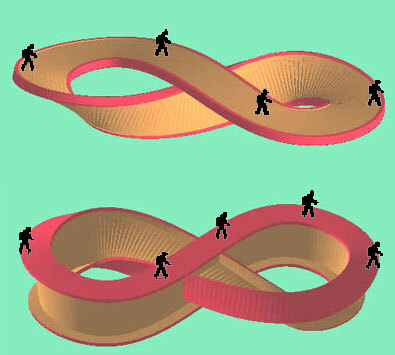 Even Escher's triply twisted Moebius band is split in the same way (Fig. 8a). However, for different materials, say, steel, it may be just as natural to split the band from its narrow sides, leading to two even thinner cross sections travelling "on top of one another" (Fig. 16c). This has the intriguing effect of creating a much more pronounced enclosed space between the two parts. That space itself now has the topological properties of a Moebius band, even though its bounding material band is orientable, i.e., double-sided (one side faces the Moebius space and the other side is pointing outward). 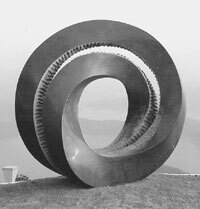 Since the major portion of this paper is concerned with the creation of twisted Moebius spaces accessible to humans, I will now focus on a sculpture that emphasizes the enclosed space rather than its bounding material walls. 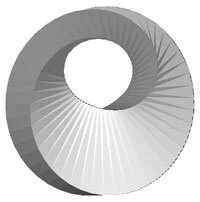 My proposed "Moebius Space" sculpture is derived from a "split torus" in which the cutting gap makes a 180 degree twist while sweeping around the torus. Since this space is the intended focus of our attention, I have widened it and also bulged it out to make it look more like a cave. To draw even stronger attention to it, I have given its wall a shiny silvery color, while keeping the outside of the torus from which it is carved in matte black (Fig. 17). (b) a physical maquette made with a Fused Deposition Modeling machine. 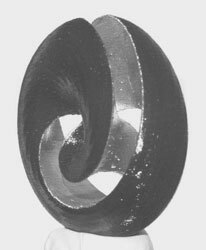 The single-sided Moebius loop is a fascinating geometrical shape and leads readily to a plethora of aesthetically pleasing sculptures. But beyond this purely aesthetic value, the Moebius form can also be transformed into practical functions such as buildings or bridges. Given the tight linking of arts and mathematics exhibited in the Moebius shape, it would be a very fitting symbol for a commemorative construction for the Bridges Conferences at Southwestern College in Winfield, Kansas. This work was partially supported by the National Science Foundation under a research grant to study the designer/fabricator interface for rapid prototyping. The synthetic figures and sculpture models have been constructed with SLIDE, a modeling and rendering system built by Jordan Smith  and Jane Yen. J. F. Barnett: "A Bridge for the Bridges," Bridges 1999, Special Session VI, Aug.1, 1999. Brent Collins: "Merging Paradigms," Bridges 1999, Conference Proceedings, pp 205-210. M. C. Escher; with permission from Cordon Art B.V., Baarn, Holland. All rights reserved. R. A. Heinlein: " -- And He Built a Crooked House --, " Berkeley Publishing Group, NJ. J. Smith: "SLIDE: Scene Language for Interactive Dynamic Environments,"